Ulundi, also known as Mahlabathini is a town in the Zululand District Municipality. 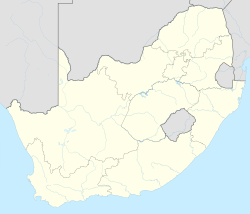 At one time the capital of Zululand in South Africa and later the capital of the Bantustan of KwaZulu, Ulundi now lies in KwaZulu-Natal Province (of which, from 1994 to 2004, it alternated with Pietermaritzburg as the provincial capital). The town now includes Ulundi Airport, a three-star hotel, and some museums amongst its sights. In the 2001 Census, the population of the town was recorded as 18,420. ^ a b c d "Main Place Ulundi". Census 2011. ^ Lyde, Lionel William (1907). "South Africa". A Geography of Africa. Adam and Charles Black. p. 97. ^ "Main Place 'Ulundi Part 1'". Census 2001. Retrieved 3 June 2011. ^ a b "Climate: Ulundi - Climate graph, Temperature graph, Climate table". Climate-Data.org. Retrieved 10 December 2013. Chisholm, Hugh, ed. (1911). "Ulundi" . Encyclopædia Britannica (11th ed.). Cambridge University Press.